Hermann Spielwaren, Coburg, Germany Limited Edition Teddy Bear. A retired edition from a private collection, absolutely mint, never displayed. This lovely HERMANN-Spielwaren GmbH, Coburg collectors' piece is made of rich high-grade German mohair, fully jointed. TEDDY BEAR IN PARADISE #141. 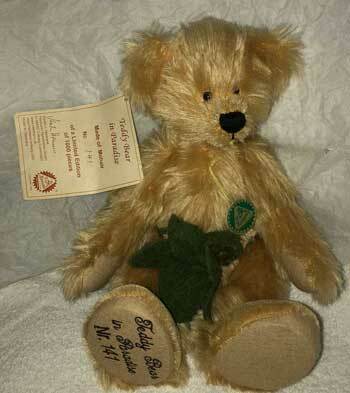 The bear comes with a Numbered Limited Edition Certificate. Light gold mohair, with polyester filling, green felt fig leaf decoration on the front. ENJOY FREE SHIPPING! (Cont. US) on Hermanns TODAY!. 11" Teddy Bear in Paradise ($250.00) SALE!